Source: NPS, Rank among 377 National Park Units 2017. Oh, no! They're back again! We wish we hadn't been right about this, but the state legislature of Pennsylvania has approved 10 new casinos to come to towns like Gettysburg and there are new rules for towns to follow to prevent them. Some gaming companies have looked into the Gettysburg area of the borough and surrounding townships, trying to identify locations. One such location! Right next to the Train Station, a Park Service Site, that Lincoln came to before the Gettsyburg Addresss. Read below how to prevent this and who to contact to urge that they OPT OUT of allowing this. Must be done by December 31. Yes, only six months after the developer pulled his proposal for the third casino project, there's a fourth on the potential way. New legislation in Harrisburg has opened up the door. During the past ten years, Gettysburg had been under siege by casinos, potential big box development plans within park boundaries, suburban sprawl surrounding the town, and a diminished historic importance to generations to come if these projects are not stopped. 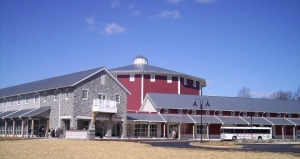 Help in the battle to continue preserving the historic charm of Gettysburg for future generations. Just last year, a potential Big Box Development Project arose to threaten the hallowed ground in the Camp Letterman area off Route 30 and adjacent to the restored Daniel Lady farm. Now this year, 2017, two rounds of potential casinos have come along that would change the tenor of a Gettysburg vacation forever. The rounds of bids for the Mini Casino licenses seem to be closed for now with five winning bidders not choosing sites within the close surroundings of Gettysburg. However, Gettysburg could be ringed by sites along Route 30. One site, the York bid, seems destined for Route 30 and the York Galleria. Another site, along the Chambersburg to Carlisle corridor, is possible for Route 30 east of Chambersburg, but is more likely for a community along I-81. The problem now, if future mini casino licenses are awarded (five could be coming, even though the Pennsylvania Gaming Commission seems to indicate they are done), is that OPT OUT communities are being targeted for a WINNING BID, even after OPTING OUT. The PA Gaming Law does allow for this. In the Chambersburg/Carlisle Casino Project, two OPT OUT communities have been contacted to change their mind, however, both, Carlisle Borough and South Middletown Township, have turned down the Casino again. This does, however, create a potential for that bid to change to a Route 30 orientation (although unlikely). More likely, is if the PA Gaming Commission bids the other five licenses in the future, is that communities such as those in Adams County who have indicated they are OPTING OUT, may be up for grabs again. So it is important to stay vigilant through this process! At the end of October 2017, the Pennsylvania State Legislature and Governor signed a bill that would allow ten new casinos in the state. 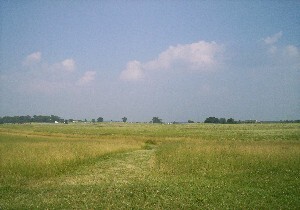 One of the potential sites can be Gettysburg as the legislation, despite repeated efforts by groups to create a buffer around the historic site, did not protect the area. 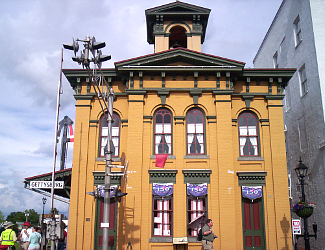 Now, each municipality around Gettysburg, including the Borough of Gettysburg, and townships Cumberland (where the majority of the park rests), Straban, Mt. Joy, Freedom, Highland, Mt. Pleasant, and Franklin, must send in an OPT OUT RESOLUTION to the state by December 31, 2017 or in a blind high bidder auction, a casino company can stake claim to an area and build a 750 slot and 50 table game casino. The area will not have a choice. So, you think it would be an easy call for the borough and townships to send in the OPT OUT RESOLUTION and protect the town. It is, and most have done it, although a few have not defined their intent. It's imperative for citizens, whether of Gettysburg or the nation, to contact the remaining townships and boroughs and let it be known that putting a casino near the most historic town in America is not the right thing to do. Most townships and boroughs in Adams County, as of December 18, 2017, have OPTED OUT, including; Freedom Township, Highland Township, Cumberland, Menallen, Germany, Tyrone Township, the Borough of Gettysburg, Straban, Franklin, Mt. Joy, and Mt. Pleasant. Some are still on the fence or have not yet voted on the issue, including Conewago Township, McSherrytown, and Abbottstown. We congratulate those that have OPTED OUT and hope that the others will follow. Remember, these OPT OUT agreements must be submitted to the State of Pennsylvania by December 31, 2017 or a casino could be coming as soon as Spring 2018. Let your Voices Be Heard!! No Casino Gettysburg. For more information, you can contact the grassroots organization of No Casino Gettysburg. CASINO PROJECT HALTED AS DEVELOPER PULLS PROPOSAL. KEEP UP TO DATE AS RUMORS PERSIST THE PROJECT COULD RETURN. For the third time in a decade, the history of Gettysburg and the legacy of the area is under siege. The sacrifice of over one hundred and fifty thousand men who fought there, and the over fifty thousand men and women who lost their lives or were wounded in the cause, are about to be marginalized by a casino project proposed for three miles south. The Mason Dixon Casino and Racetrack in Freedom Township would change forever the rationale for visitation. Hotels and motels would spring up around the interchanges south of town along the Route 15 corridor; homes and strip malls would fill in the gaps between the casino and the park. Instead of like minded family oriented visitors at the continental breakfast at your Gettysburg vacation hotel, the guest next to you is a cigar chomping, can't wait to gamble Type A personality trying to get his latest must win fix. So now, once again, it is time for the history crowd to stand up and fight for the legacy of Gettysburg. Don't allow David LeVan, for the third time's the charm effort, to build the Mason Dixon Casino near the park. We've warned that this was coming; we've urged the Pennsylvania legislature to place a ten mile buffer around the Gettysburg park, but they did not see this on the horizon. And don't let the propaganda of the proposal sway you in this effort. Yes, there is a casino next to Valley Forge, but the area of Valley Forge has been ruined by the shopping malls, high rise condominiums, and development that has changed that park from a pure history location to a recreation park. Don't let the word that it's okay to have a casino near Gettysburg, because there's one near history in Philadelphia. That's a metropolitan city. 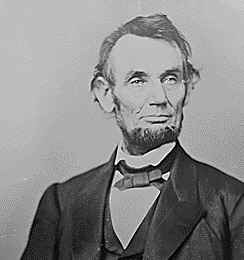 Keep Gettysburg for history. Generations of children to come need to know just how important this site is. Your help in defeating this proposal will show just how much you care about that. There are currently two Petition efforts to convince the Freedom Township Commissioners to deny a zoning change that would allow the project to continue, as well as efforts to convince the Pennsylvania Gaming Board and Horse Racing Commission to deny. Add your name to the lists below. Watch the wonderful videos below put together by the No Casino Gettysburg and Civil War Preservation Trust coalition during the last round. It includes well known people who are against the casino idea, including Sam Waterston, Matthew Broderick, Ken Burns, and others. A second video by the same actors, all reciting the Gettysburg Address is also included. Casino Project in Gettysburg Denied Again by PA Casino Board - On April 14, 2011, the Pennsylvania Gaming Control Board voted against the Gettysburg casino project and awarded the license to the Nemacolin resort south of Pittsburgh. The proposal had been to place a Casino in Gettysburg, this time just 1/2 mile from the southern end of the field on Emmitsburg Road, right along the Journey Through History. Spearheaded again by Gettysburg businessman David LeVan, this project was centered around the current Eisenhower Inn. Yes, it's happening again. This time the large development project is a Big Box Retail complex and housing over the remaining one hundred acres of Camp Letterman and the Confederate staging area for the battle of Culp's Hill. This land is directly north of the Daniel Lady farm on Route 116, between it and Lincoln Highway. While the project is still in its planning stages, this is the time to stop it, or the complex of retail and hotel establishments already there, i.e. Giant and the hotel chains, will take over the entire viewshed from the northern end of the park, and remove the historic landscape where thousands of soldiers trod, and were later cared for. Currently, in June 2017, the Gettysburg Battlefield Preservation Association is attempting to get the land of Camp Letterman registered in the National Register of Historic Places, as well as working with the township and developers to potentially buy the land before development. You can sign their petition to stop the projects and preserve the land at their website. So, how can you help? Join with the Gettysburg Battlefield Preservation Association and other national organizations that are organizing to save this land. The developer is said to be open to selling for preservation, but at a high price rumored to be $8 million. Sign their petition. Call the local Straban Township office and tell them what you think. This is all happening fast, May 2016 through today, and while the project is in its beginning phases, to stop it from happening requires prompt action. Think about the possibility of losing this ground forever. Think about the better possibility of interpreting this land for the history generations to come, both about the battle for Culp's Hill itself, and for the post battle hospital complex Camp Letterman. That would be the better outcome. Help make that happen. 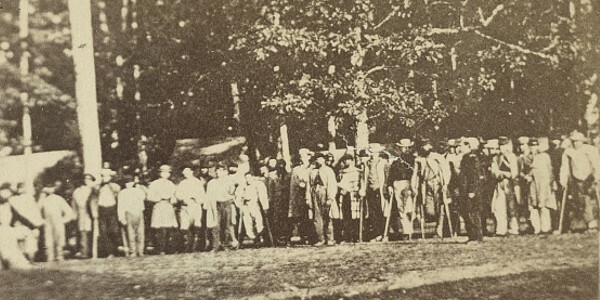 Above photo: United States Christian Commission in August 1863. 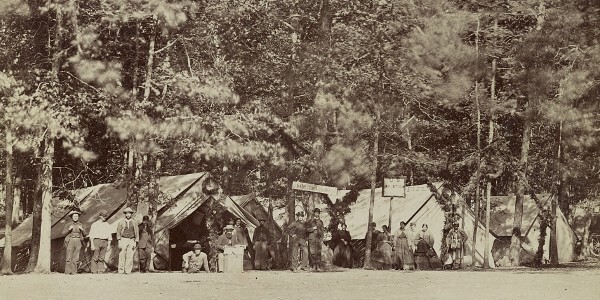 Below: A group of soldiers in front of the woods at the Camp Letterman hostpital. Photos courtesy Library of Congress. Traffic becomes congested, commercial malls string along the the roadways, mile after mile after mile. The rationale for coming to or even living in Gettysburg is no longer predicated on its past, in fact, its not predicated on its present either, just another excuse to commute to work in the more important locations, i.e. Harrisburg and Baltimore. Gettysburg National Military Park now becomes another Valley Forge, surrounded by office towers, highways, and homes, and now more of a recreation park than a historic park for most visitors. It becomes another Manassas, with rampant development knocking at its doors from all directions. It becomes another Fredericksburg, a town with tons of history, but with a highway that is more important, and land that is no longer indicative of the history from its past, but another excuse for commercial development. Don't think that's true, try to envision the charge at Marye's Heights compared to that at Pickett's Charge. And we won't even get into the Battle of Franklin. And it loses out on commerce. Even in its bad years, Gettysburg still draws between 1 and 2 million visitors per year for its charm and history. In good economic times, it draws between 2 and 3 million. Do we really think this will increase with casino gambling and more residential and commercial devlopment? Despite the economic climate within the housing industry and mortgage market, developers are now back and trying to develop the Gettysburg area as a housing corridor for commuters to Harrisburg and Baltimore. Land surrounding the park has been at risk for years, including land in Hunterstown, site of cavalry action, but has been on the backburner during the economic recession. It won't stay that way forever. Please contact the various preservation groups that are trying to protect these lands and make a point that it is preservation and the history that matters here. Some, including the Foundation, may be losing sight of that goal, as they move into different, and well meaning, roles, including the running of the new Visitor Center and Museum. They must not lose sight of their mission, however, and spend their time and effort on both interpreting the battle and saving the land that it was waged on. Contact the Gettysburg Foundation and urge them to spend their money on interpretation and land preservation. 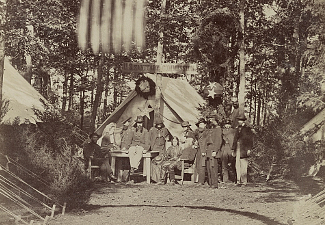 Photo above: United States Sanitary Commission in charge of Camp Letterman, August 1863. Courtesy Library of Congress. 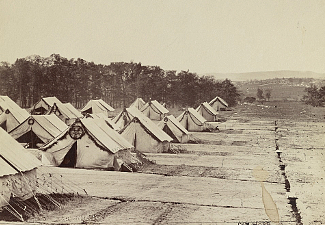 Contact the American Battlefield Trust, the former and expanded Civil War Trust and give what you can to secure the land currently being purchased with the help of the trust and any future lands. They have recently been instrumental in the purchase of nearly 100 acres of the 1st Day fighting land, including the Gettysburg Countryclub, Benner, and Power's Hill properties, and land across from the entrance to the new visitor center. Contact the National Park Conservation Association and let them know you want to see Gettysburg wrested from the hands of townhouses, big box stores, and commuter developments. Since casino gambling has come to Vicksburg, Mississippi, at the end of 1993, attendance at Vicksburg National Military Park has dropped more than 35%. That means that 35% fewer parents and their children would potentially come to witness the historic events at Gettysburg and learn the history of the most important small town in America if a casino comes there. 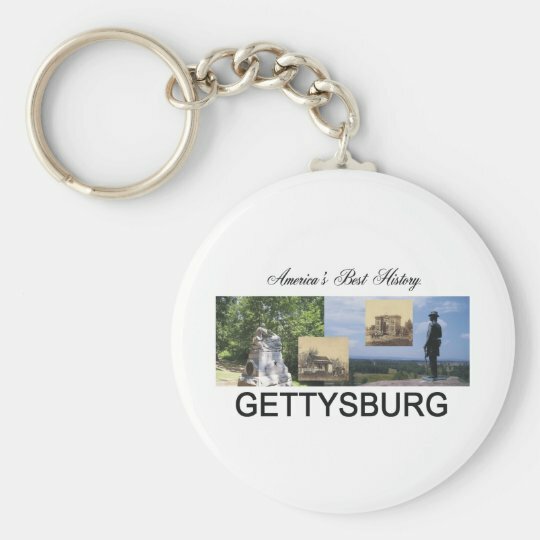 In a time when we worry about education and making sure the next generation knows about its heritage and past, why take the chance that this happens in Gettysburg.